The entire tutorial takes about 10 hours to complete and is tailored towards students aged 12 and above. In the first tutorial (this one) we will be looking at how the DanceBot works, and will be covering how to read circuit diagrams. In the second tutorial, we will look at how to construct the DanceBot’s power supply. 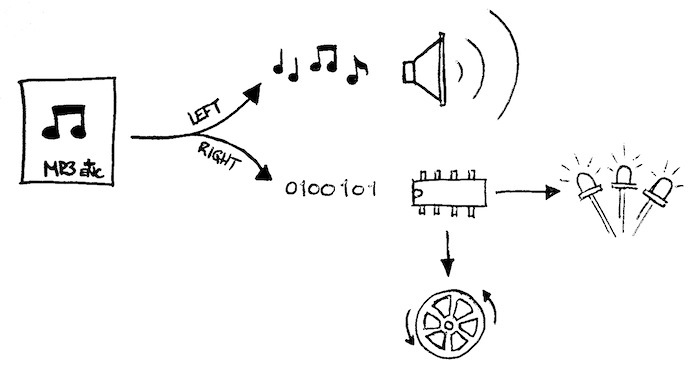 In the third tutorial, we will be building the DanceBot’s audio amplifier. In the fourth tutorial, we will build the DanceBot’s micro controller, digital line converter and H-bridge. In the fifth tutorial, we will assemble the DanceBot’s LEDs. And in the final part, we will look at the mechanical construction, and how to program your DanceBot to groove to your favorite tunes! Fun, funky and fabulous, but how does it work? The picture below is a rough sketch of what we’ll be building in these tutorials. You’ll see some common elements found on many robots. The key to how all of this works is the music that is played by your MP3-player. There are generally two channels (i.e. left-channel and right-channel) for music that you play on your MP3-player. These channels send music to your left and right ear, respectively. In the third part of the tutorial series, using the provided software, you will program dance moves into your favorite song by replacing the right-channel of music with binary-encoded dance moves! 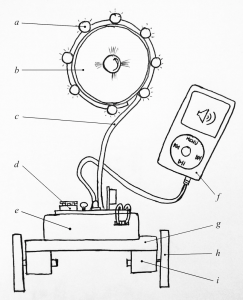 When your MP3-player is plugged in and you play your encoded song, the left-channel goes directly to an audio amplifier and plays the music through the speaker, while the right-channel goes to a small computer, which interprets the digital information as motor and light commands. The left channel of the newly encoded MP3 file is just your regular music, which is played through the DanceBot’s speaker. The right channel is replaced with digitally-encoded dance moves. These are sent to a small computer, which interprets them as motor and light commands that instruct your DanceBot how to rock around the clock! A schematic is a drawing that shows us how electronic components connect together and where they are placed on the printed circuit board (PCB, the picture below). If you, like most people, don’t have the ability to print a circuit board, don’t worry, prototyping boards will work just fine! For the DanceBot’s workshop (taking place yearly in the Swiss town of Fiesch), we have circuit boards printed for the students. But don’t worry, prototyping boards will work just fine! Before we start assembling the electronics, it’s important to know how to read the DanceBot’s schematic. 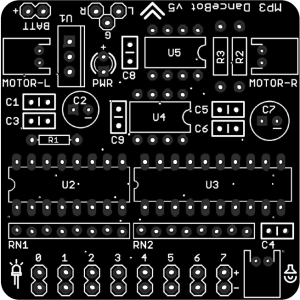 You can download the schematics for this project here. Below you will find a list of common elements, which you can identify on the schematic and on the PCB. Now take a look at the schematic. Notice that beside each symbol in the schematic is a name (black) and a value (blue). The Name helps to identify the location of a part on the PCB (the picture above), while the value identifies the value of the part, as described in the table above. Each component on an electrical schematic typically has a name (black) and a value (blue). Here, the name is C1 and its value is 100 nano-farads (nF). In addition to name and value, some parts have a polarity. Be careful! This means you need to put them in the right way, otherwise things won’t work and could get damaged! Diodes have a polarity, and in this project some capacitors have a polarity too. In the next tutorial, where you will assemble the DanceBot’s electronics, we will warn you of any components with a polarity. If you don’t know where to start with these steps, a friend with electronics experience will definitely be able to help! 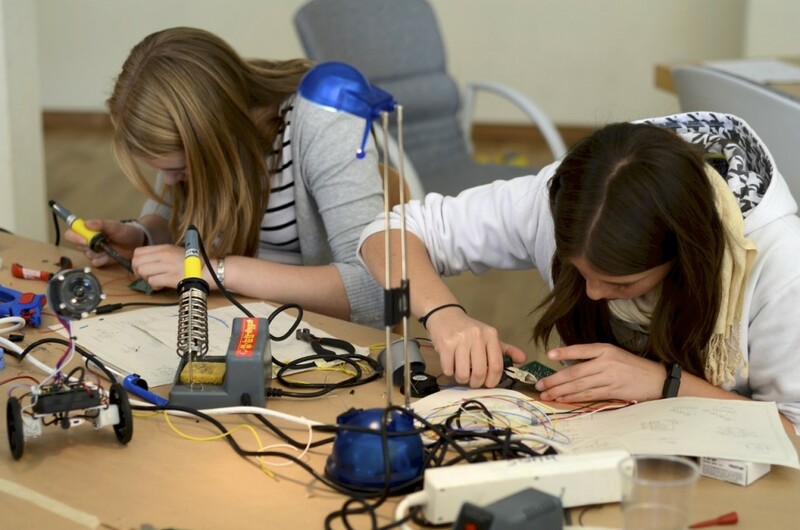 Once you have organized the above, take some time to learn how to solder and learn how to use a multimeter to check connections. Stay tuned for the second tutorial!